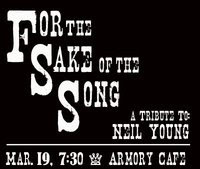 A Tribute to Neil Young by For the Sake of the Song is coming March 19th in Boston. The tribute will be held at the Armory Cafe. The band For the Sake of the Song will be joined by singer/songwriters James Houlahan and Brendan Hogan, as well as guitar/cello duo Flightless Buttress, so hope you'll join us for another great show! Tickets are $8 at the door and doors open at 7:30pm. Just singing a song won't change the world? What one group tries to take away, the other group learns how to preserve whether through song, art, or sculpture or cave paintings. It's been this way since the beginning of human history. Rock on, Neil's moon children in Boston!